Has The Trapster Ever Used His Paste-Gun to Try and Suffocate Someone? Was largely just curious, because apparently, the character has made various versions of his Paste-Gun and various adhesives to shoot. Any feedback from any medium is acceptable. 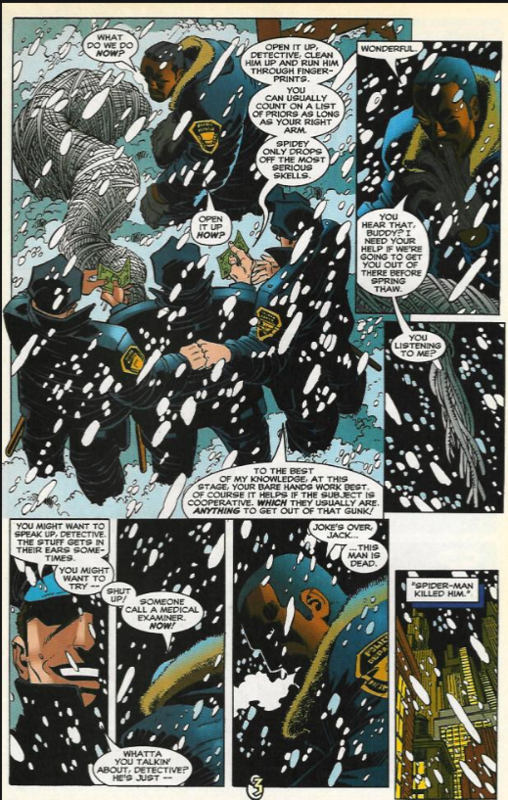 In Spider-Man #88 (1998) there is a story called "Who Did Joey Z?". It is the start of the arc called "Identity Crisis" (not to be confused by the DC story with the same name). The story begins when a petty crook called Joey Z is found by the police netted up Spider-man style. Things take a turn for the dark however when the police cut him down and find out that he is dead. 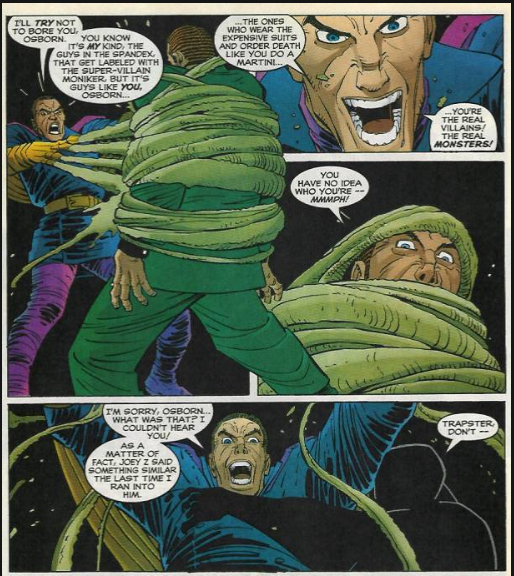 Spider-Man gets the blame and is hunted by everyone, cheered on by Norman Osborn that places a 5 million dollar bounty on him. To be able to move freely despite the manhunt Spider-Man decides to take on four new identities that he uses to look for clues undisturbed. It is soon revealed that the spiderweb is just a good fake and that Joey Z had suffocated from it. Spider-Man figures that the only one he knows that could make a web similar enough to imitate him is the Trapster. Spider-Man learns that Norman has recently placed a bounty on the Trapster's head too and when Spider-Man finds him while using his Dusk identity they are attacked by the super villain Shocker who intends to collect it. 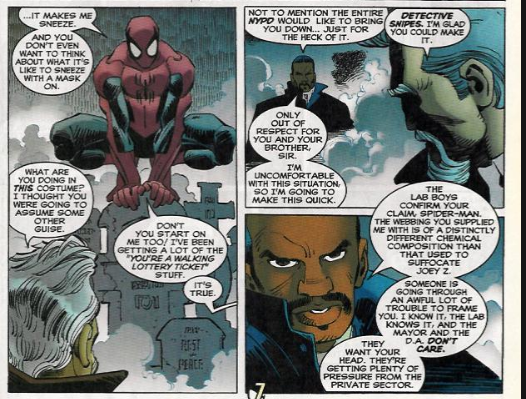 Spider-Man, as Dusk, protects the Trapster while pretending to be a villain himself, and thereby gain his trust. When Shocker is down the Trapster shows that he is more than willing to use his glue in macabre ways. The Trapster admits his part of the murder and reveals that Norman Osborn was behind the whole thing. They go and confront Norman who tells them that he had put the bounty on the Trapster to remove any evidence that could point towards him. 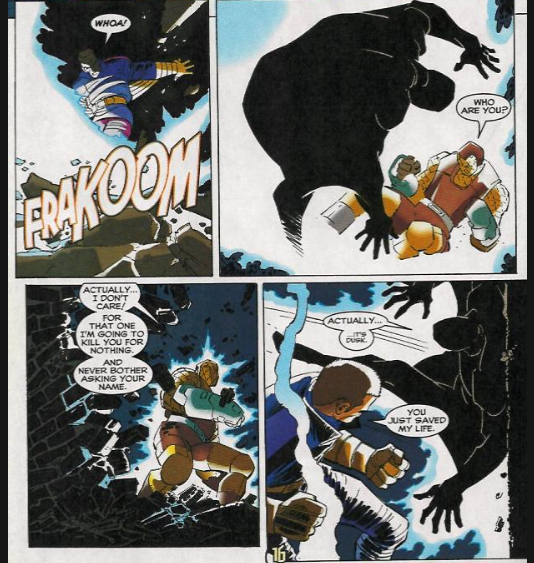 The Trapster goes nuts and decides to kill Norman in the same way Joey Z was killed. Dusk wont let him do it however, and Norman gets away. The Trapster then goes to the police and confesses, hoping that that this will cause Norman as much problem as possible, thereby clearing Spider-Man's name. I think it is clear in this story that the Trapster murdered Joey Z by gluing him up until he suffocated. He also showed he was more than willing to kill people with his glue, and that he would do it again if provoked enough. Not the answer you're looking for? Browse other questions tagged marvel fantastic-four or ask your own question. Has Spidey ever made a quip that cost someone a life? Who is the most powerful character Hulk has defeated ever? Are Spider-Man & Deadpool the only characters who have met alternate versions of themselves? 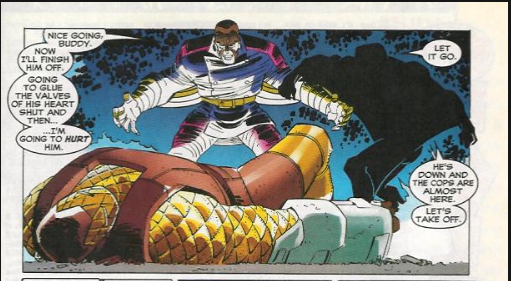 Can Masque Use his Power to Suffocate Someone? On the beach in X-Men: First Class, why didn't Erik just take Moira's gun using his power? Has Mister Fantastic ever used his elasticity to impersonate someone? Has Daredevil ever lost his faith?